In the smart city of the future, intelligent control logic systems for electricity, gas, and water will save valuable resources. Examples here are intelligent measuring points and solutions for tailored street lighting. Overall, revenues in the energy market segment of the smart city will experience particularly strong growth, increasing by 19.9 percent per year until 2022. This is a core finding of the study, “The German Smart City Market. Facts and Figures.” Here, the strategy and management consultancy Arthur D. Little (ADL) and eco – Association of the Internet Industry examined the sales potential of smart city in ten market segments. In addition to the energy market, other segments explored included transport and logistics, communication services & network security, building automation, and the health industry. The experts estimate that the segments are growing by an average of 16.5 percent per year. This corresponds to an increase from 20.4 billion Euro in 2017 to 43.8 billion Euro five years down the line. Riegel envisages particular growth occurring in the area of electric charging. 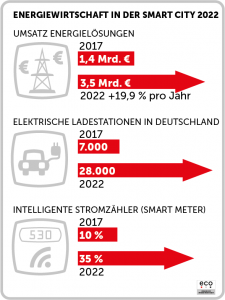 Here, the number of electrical filling stations in Germany will almost quadruple from barely 7,000 today to close to 28,000 by 2022. Smart street lighting is also booming, as some more assertive providers are pre-financing the municipalities’ infrastructure and then refinancing it via the cities’ energy cost savings. This model is particularly in demand because it takes into account the cash-strapped situation of many cities and municipalities, goes easy on the environment, and produces real cost savings. However, the highly promising advances of the smart city can only be realized if the data infrastructure expansion keeps pace. This not only concerns the expansion of mobile communications and fiber optics, but especially the availability of highly efficient data centers and high-performance Internet exchanges. The significance of these for digital transformation must finally be acknowledged by politicians, who need to then present corresponding strategies.